This dairy-free Coconut Passion Fruit Bircher Muesli has been my favourite breakfast lately. Something I have been really missing since eliminating most dairy products from my diet is plain yoghurt. 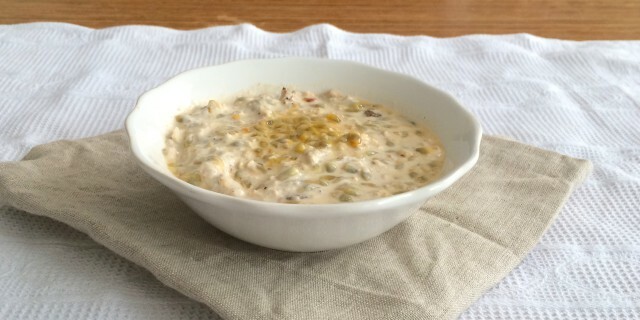 In my Coconut Passion Fruit Bircher Muesli I use yoghurt made with coconut milk and it’s so delicious. It’s a fool proof, super quick and easy recipe. I make it mostly for the mornings when I teach yoga very early and I’m looking for a very quick and easy breakfast. The evening before I soak my muesli (feel free to use any combination of grains, nuts, seeds, dried fruits etc. you like) overnight in water with a squeeze of lime juice. The next morning I remove my bowl from the fridge and add three heaped tablespoons of coconut yoghurt. and the pulp and seeds of one passionfruit. I really enjoy the sweet and sour flavour of passionfruit which combines so well with sweet and tangy flavour of the coconut yoghurt. It’s a very refreshing breakfast, just prefect for a warm spring or summer morning. If you like this recipe. you might also enjoy this classic Swiss Bircher Muesli recipe with apple and strawberries.